I am still using the Logitech Elite Bluetooth Keyboard I bought years ago. 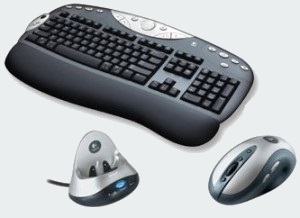 It was sold in a bundle with a Bluetooth Optical Mouse MX900 and a Bluetooth Hub. That Hub also served as a cradle to charge the Mouse. Since I don't user the Mouse anymore and don't need therefore the Cradle to recharge it, I thought I could get rid of it if I could connect the Keyboard on a Generic Bluetooth dongle or even better: on my onboard Bluetooth. Actually, I don't use the MX900 mouse anymore since the Cradle does not recharge it anymore. I think the "contacts" are dead. This seems to be a quite common issue. The Bluetooth must already be installed. The default "drivers" (Bluetooth stack) from Microsoft will work fine. Right-click the Bluetooth icon in the system tray and select "Add a Bluetooth device." Click "Add a device" on top of the Devices list. While the Wizard is searching for new devices press the "Connect" button behind the Keyboard (The small white button next to the battery compartment). A generic Keyboard will appear in the list. It will only be displayed as a Logitech Elite Keyboard once installed. Once the keyboard detected and added, Windows will prompt you to type a passkey on the Keyboard. You must end by pressing 'Enter' to validate the passkey. Now, you have to disallow Windows to turn off the Bluetooth while entering the sleep mode otherwise the Bluetooth keyboard will appear "Offline" when you wake up the computer. Right-Click the Bluetooth icon in the system stray and select "Open Settings"
Click on "Change settings". You will see a new tab "Power Management"
Open this "Power Management" tab and deselect "Allow the computer to turn off this device to save power". The computer may have to be rebooted if the keyboard is not immediately enabled. The only drawback is that I won't be able to use the keyboard at boot time (e.g. : to enter the bios) or in safe mode. To support that, the Logitech Bluetooth Hub came with a PS/2 connector. The Product Version of my Nabi was 1.9.37 before rooting the device and installing the Gapps and it was still that version when the problem occurred. I was using TWRP 2.2.2.1 as my Nabi 2 is suffering the Touch Screen Calibration issue with any next version. The easiest to do that is to use the Nabi Lab v2. It's so well done and clear that the details provided here after are actually useless. If your PC is not ready (has the drivers) anymore to connect on the Nabi, use first the menu 1. Use next the menu 3 to restore the stock firmware. After this, my device was still running the Product Version 1.9.37 and all the original applications from Fuhu were back. Reboot the device and go to the Settings > About tablet > Update to get the very latest Product Version. I didn't use the menu 1 to install TWRP, root the device and install Gapps because I wanted to keep the TWRP 2.2.2.1 proved to fit my Nabi regarding it's Touch Screen Calibration issue. Finally, use the menu 3 to install Gapps. Et voilà. Wi-Fi is working and my Nabi is still rooted and has access to Google Play. I did try to install TWRP 2.5.0.0 for Nabi 2 but I was still experiencing the Touch Screen Calibration Issue. What is still not great with the Nabi 2: there is no native support to move applications from internal to external SD. It's well known that not all applications can be moved (Ex. : those with Widgets currently in use, ...). But they could offer something to move the others like use of "simlinks" for each moved .apk..